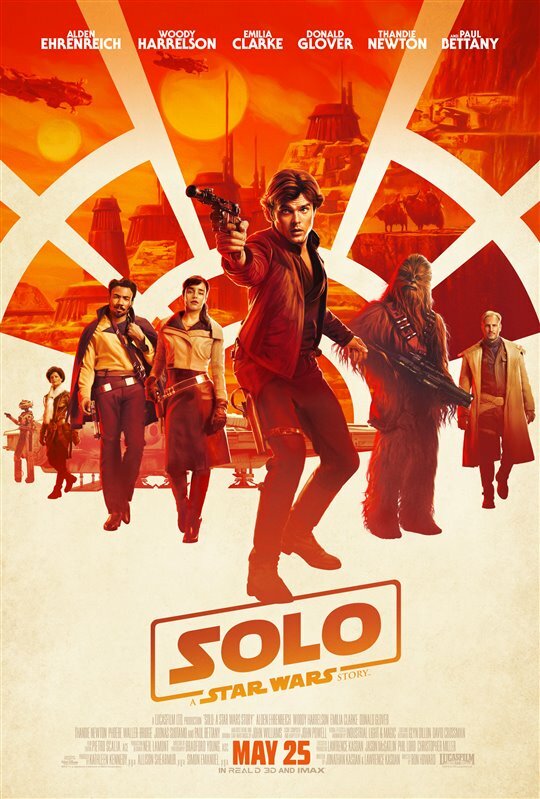 The latest entry into Disney’s rapidly expanding Star Wars universe, Solo: A Star Wars Story is a prequel to the original film that seeks to explore the origins of everyone’s favourite scoundrel and rogue pilot Han Solo, and does so with fairly entertaining but also somewhat mixed results. The film opens with a young Han (Alden Ehrenreich) working as a slave labourer on Corellia, and trying to escape the planet with his girlfriend Qi’ra (Emilia Clarke). When he gets separated from her, Han signs up to become a fighter pilot, and ends up working for the crime leader Tobias Beckett (Woody Harrelson), who is hatching a plan to steal a shipment of the fuel coaxium. 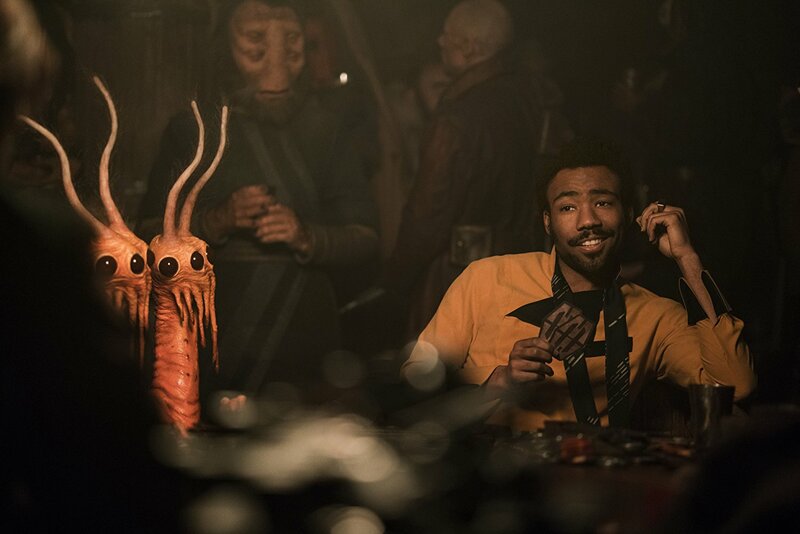 The film mainly serves to answer questions such as where Han got the last name Solo, how he came to meet his trusty Wookie co-pilot Chewbacca (Joonas Suotamo), and how he got the Millennium Falcon from the playboyish gambler Lando Calrissian (Donald Glover). Han’s claims of “completing the Kessell run in under 12 parsecs” also provide the basis for one of the big set-pieces. This does allow for several fun moments of backstory that Star Wars fans in particular are sure to appreciate, but not all of these questions needed answering, which is one of the main challenges of the film. This is the second offshoot of the saga following Rogue One in 2016, but Solo: A Star Wars Story lacks the same sense of purpose that made that spinoff so thrilling. It’s easily the most straight-forward film in the series, and the fairly basic heist plot can feel stretched thin at over two hours. Because Han Solo was already so well developed in the original trilogy, it’s not like this film needs to spend time allowing us to get to know him, and if anything seeing a new actor trying to take on Harrison Ford’s iconic role can be somewhat distracting. The aesthetic of the film is also overly dark at times, with the murky and washed out colour grading sometimes making it seem far too serious, when a more lighthearted touch likely would have served the story and the wisecracking central character much better. By this point, the production troubles behind Solo: A Star Wars Story have been well documented, so it’s hard to really talk about the film without bringing them up. When the film was in the midst of production just under a year ago, the original directors Phil Lord and Christopher Miller were fired from the project, with producer Kathleen Kennedy citing “creative differences,” and saying that their style was much too comedic. Ron Howard was brought in to complete the film and he reshot much of the footage, and while he has done a thoroughly competent job of assembling the finished product, it’s also hard to ignore the lingering question of how it might have turned out if Lord and Miller had remained on the project. There were also rumours of an acting coach needing to be brought in. While Alden Ehrenreich delivers a fine performance as a cocky young pilot, I also never really believed him as Han Solo. The main problem is that he doesn’t look or sound that much like Harrison Ford. His voice is a different pitch. He has a different hairline, with deep widow’s peaks. His jaw is squarer and his face less round, and he doesn’t have that iconic half-smile. Based on looks, they actually would have been wiser to go with Anthony Ingruber, who played a younger version of Harrison Ford’s character in The Age of Adaline, and bares much more of a resemblance. Ehrenreich does deserve props for trying to make the role his own, and he does bring a certain charm to the character, but it’s just not the same. This basically confirms my belief that much of what we came to know and love about Han Solo has to do solely with how Harrison Ford played him. The original character’s flippant and cynical “don’t give a damn” attitude was likely due to Ford’s own indifference on set, and that’s a hard thing for anyone else to properly replicate. While Solo: A Star Wars Story is an often entertaining film overall, and many of the individual set-pieces are quite well staged, I ultimately found myself wanting more from it. It’s a fine summer blockbuster, that works well enough for what it is, but I just wish that I could give it more of a passionate endorsement. It’s still worth seeing, of course, just temper your expectations. In the new lineup of Star Wars films, which Disney has been cranking out yearly, comes Solo. A much anticipated look at the character of Han Solo in his younger years and how he became the pilot of the Millennium Falcon, a character that we all met and became intrigued by in Star Wars: A New Hope. The film opens with Han Solo (played here by Alden Ehrenreich), on a slave-worker planet being forced to work in factories and scrounge for things to sell, along with his friend Qi’ra (Emilia Clarke). When Solo escapes the planet but Qi’ra is forcibly left behind, he joins up with the Imperial army in order to become a pilot, earn enough money to get his own ship, and go back to rescue her. Along the way he gets drawn into a smuggling scheme run by Beckett (Woody Harrelson) and Co., and teams up with the young gambler Lando Calrissian (Donald Glover) who is the current captain of the Millennium Falcon. While there is a lot of action, the issue here is that part of what makes the character of Han Solo so interesting are the little bits of his backstory that are suggested by off-hand comments that he makes. One example is his famous brag of being able to “complete the Kessel run in 12 parsecs*” (when no one thinks it can be made in under 20). Here we get to actually see how Solo did it, but the question is, do we really need to know the ‘how’ for this line to work, or even actually know for sure that what Han says is true? Sometimes showing us everything takes away a bit of the intrigue, and on the flip side knowing that he has done it (from A New Hope) takes away some of the suspense watching the character attempt it here. The film is also well over 2 hours long and felt it could have been cut by 20 minutes without losing anything. Finally, that brings me to my last issue with the film. Don’t get me wrong – I was entertained throughout and overall can say it was enjoyable enough to watch – but I never saw the character as Han Solo. I was watching some space story about a cocky young pilot, but it wasn’t Han Solo. Unfortunately, Ehrenreich just doesn’t look enough like a young Harrison Ford, nor embody his movements and mannerisms consistently enough to create that leap for me to believe they are the same character. So, if you are looking for a way to see Han Solo back on screen and enjoy the famous character in new stories, this is not quite it. It’s something, but it’s not like watching the character again and I think on that front the mark was missed quite a bit here. In conclusion, Solo is an entertaining summer blockbuster but it misses some of the oomph of previous outings. While at times the colour-grade (use of grey-scale washes) seems to try to emulate Rogue One, neither the characters nor story have the same uniqueness that that film managed to capture (and another colour-grade may have actually matched this story better). Another important note is even if you haven’t seen any of the new Star Wars films (The Force Awakens, Rogue One, The Last Jedi), you can still watch Solo and won’t be a bit lost. On the other hand, if you have been keeping up with all of the new stories in the Star Wars set, you are likely going to want to check this one out – and it delivers enough for the price of the ticket. Still, I almost wish it had delivered a little bit more. *A parsec (pc) is a unit of measurement and not time, as the suffix ‘sec’ leads one to believe. The word comes from ‘parallax’ and ‘arcsecond’. When the distance between two locations of observation looking at a third location is 1 Astronomical Unit (AU), and the parallax angle is one arcsecond (1”), the distance to that third location is 1 pc. One parsec is approximately 3.26 LY long. Thus, as shown in this film, Han can make the Kessel run on a route with a distance 26.08 LY shorter than normally thought (and not because of time-dilation/length-contraction or relative observation). 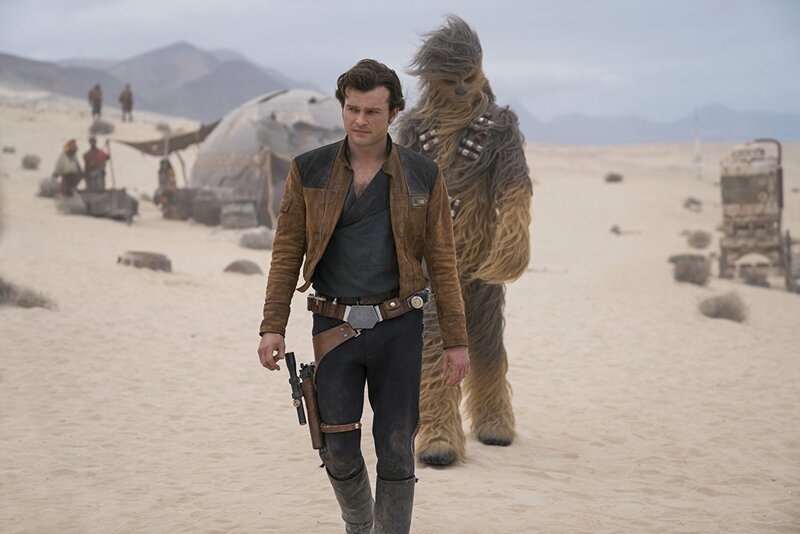 Solo: a Star Wars Story (outside the trilogies) tells the early life of Han (Alden Ehrenreich), a petty criminal aiming to become the best pilot in the galaxy. We first meet him stealing a levitating speeder in a chase through the dark streets of his home planet to get to his girlfriend Qi’ra (Emilia Clarke). Later, after a stint in the imperial forces he falls in with a gang led by Tobias Beckett (Woody Harrelson). We see how he meets Chewbacca (Joonas Suotamo) and the gambler Lando Calrissian (Donald Glover), whose Millennium Falcon spaceship also plays a starring role. Han has to survive in a cutthroat underworld where no one can be trusted. Although The Force is not a factor here, Solo has a compelling story with an often witty script and interesting characters that fit well within the Star Wars saga. As Han Solo, Alden Ehrenreich is not as cynical as Harrison Ford but believable enough in his youthful confidence. In addition to Qi’ra, there are good female roles here, including Han’s first crime boss (voiced by Linda Hunt), Tobias’s partner Val (Thandie Newton), Lando’s droid rights activist partner L3-37 (Phoebe Waller-Bridge), and the rebel Lexi (Lily Newmark). Paul Bettany is chilling as the evil crime boss Dryden Vos in his tall art deco flying yacht. Beckett’s multi-armed pilot with attitude Rio is voiced by Jon Favreau. As usual, director Ron Howard has given a cameo role to his little brother Clint, being dragged out of a droid cage match. As in the other Star Wars films, Solo includes lots of interesting critters and great action scenes relying less on CGI than real sets and ILM miniatures, including a heist in the (Italian) mountains on a theme park inspired twisting monorail train, and an uprising of enslaved droids and Wookiees incited by L3-37 and Chewbacca. Though it doesn’t include the iconic title music, the fine score by John Powell has some input from the original Star Wars composer John Williams. To sum up, Solo: a Star Wars Story is an entertaining addition to the franchise.